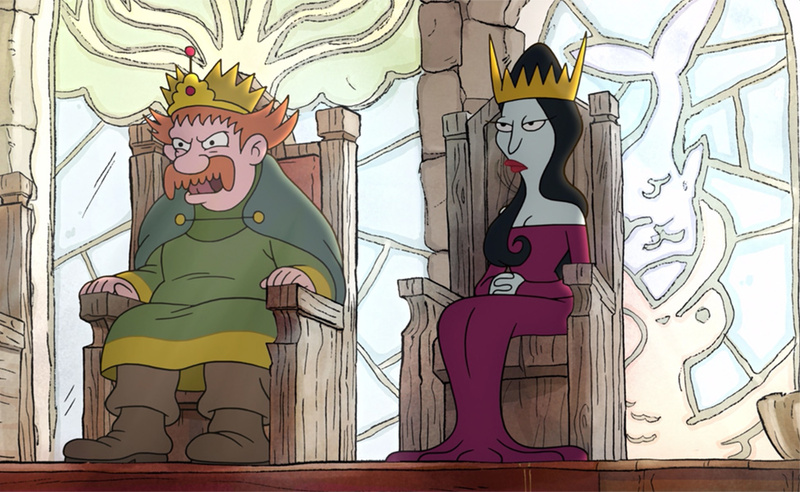 In Disenchantment, Queen Oona is the second wife of King Zog and the stepmother of Princess Bean. Being from Dankmire, she is reptilian with gray skin, a prehensile tongue, the ability to climb walls, and the ability to reproduce by laying eggs. 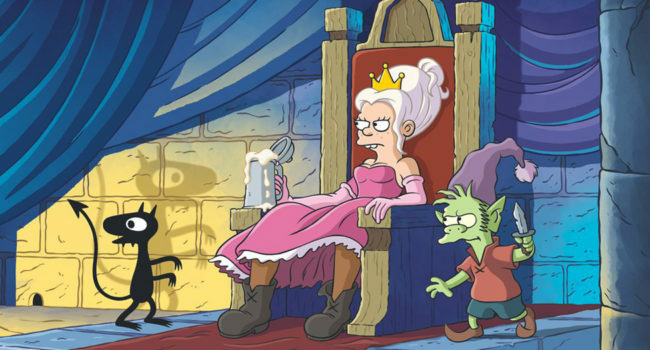 In Disenchantment, Princess Tiabeanie, known as Bean, is the princess of Dreamland. 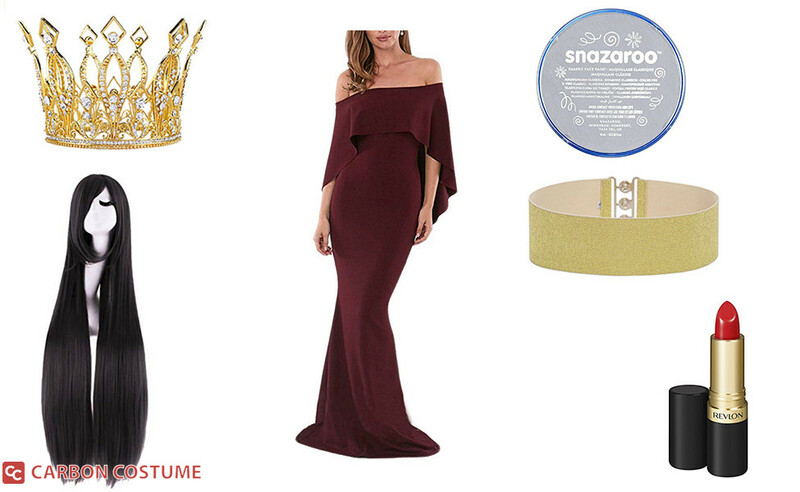 Despite this, she is tomboyish and prefers to wear pants rather than flowing gowns. She’s forced into an arranged marriage to honor a treaty with a neighboring kingdom, but manages to get rid of her suitor. 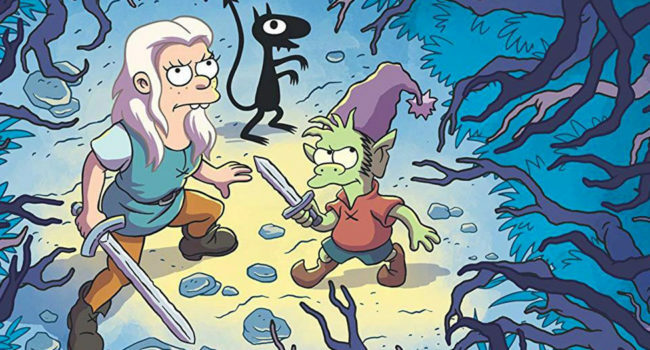 In Disenchantment, Luci (voiced by Eric Andre) is a black shadow-like creature who is Princess Bean’s personal demon. Contrary to popular belief, Luci isn’t short for Lucifer, but rather Lucille. The People of Dreamland often confuse him for a cat. 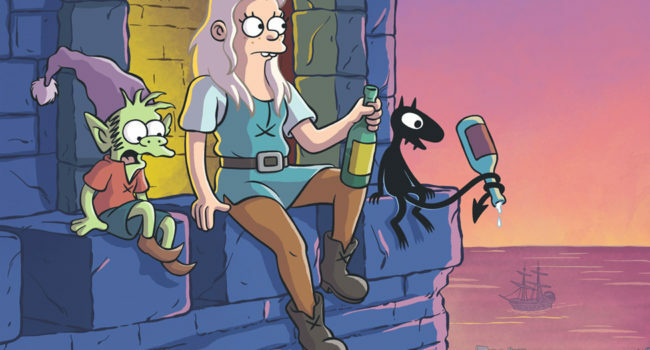 In Disenchantment, Elfo is a lime-skinned elf hybrid who is dissatisfied with the perpetual happiness of Elfwood, and leaves it for the adventure of Dreamland. There he meets and becomes a companion of Princess Bean. 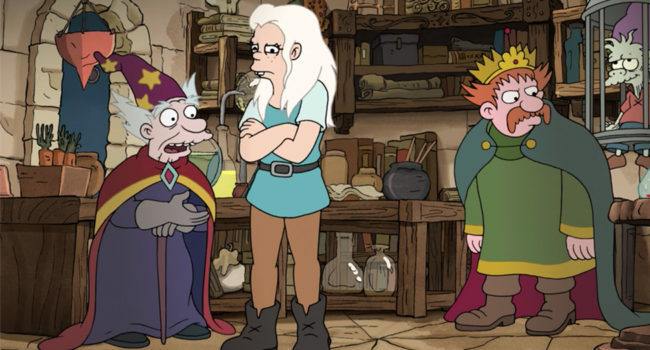 In Disenchantment, Sorcerio is a wizard serving as the science advisor to King Zog. His main duty is to extract blood from Elfo and turn it into an elixir of life, which he fails to do on multiple occasions. 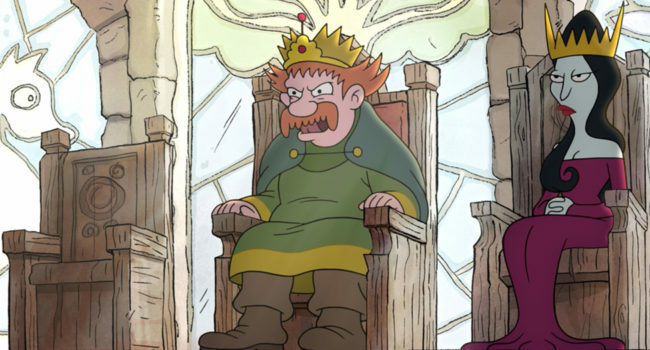 In Disenchantment, King Zog is the proud ruler of Dreamland and the ornery, vulgar father of Princess Bean. He is married to his second wife, Queen Oona, but seeks the elixir of life to restore his first wife Queen Dagmar, who was turned to stone many years ago.